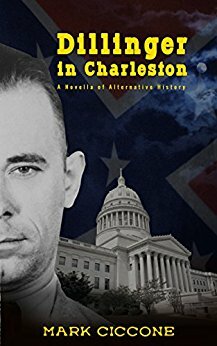 I’ve been lucky enough to be invited to submit the occasional Alternate History book review over at the new Blog being run by Sea Lion Press – and my first review (and the first review for the entire blog) is of Dillinger in Charleston by Mark Ciccone. I’ve reviewed Mr Ciccone before, looking over his first novel Red Delta here on the blog, but now I’m starting to review his earlier Alternate History novellas – starting with this counter-factual tale of FBI Agent Charles Dillinger, a Cold War between the United States of America and the Confederate States of America, and some shady dealings in the port city of Charleston. So why not click here to go over to the Sea Lion Press Blog and take a look at my review?